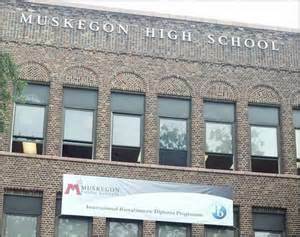 Muskegon Police Department is investigating a large fight that broke out atMuskegonHigh School, 80 W. Southern Ave. The School Resource Officer (SRO) was at the school and attempted to break up a fight between two female students in the cafeteria when another male student attempted to interfere. The SRO radioed for assistance and responding officers, along with Muskegon High School staff, broke up a half dozen more fights and detained at least 9 other students. It is unknown at this time what started the original fight. Pepper spray was used by officers to break up the fighting and one student was transported to a local hospital after complaining of a minor injury. No other injuries were reported and no weapons are believed to be involved. Order has been restored and several officers remain atMuskegonHigh School, working with school administrators, as classes resume. One student has been lodged at the Muskegon County Jail and the investigation continues to determine possible charges on the remaining students.